Career Power helps professionals in technology discuss real work challenges while having fun. It can be played with friends, colleagues, or a working team. When played by a group of people with a range of experience and job roles Career Power facilitates conversations needed to help early professionals gain insight into career success. Try Career Power as part of your on-boarding, team bonding activities, or mentoring program. As players movie around the board they discuss cases, advance their job status, face policy changes and encounter challenges of product development. The cases and answers in the game emerged from field interviews with women in technology ranging from 25 to 55 across multiple job types. Points are gained when players pick the answers that reflect good career choices or are stretch ideas that might be recommended by a mentor. Career Power was developed as part of the WIT-y Games initiative. The game concept is in response to our research findings that many women report not knowing what to do to be successful or how to navigate issues faced in their every day work settings. The game and cases were designed and iterated with multiple rounds of players of multiple genders, ages, and job types. 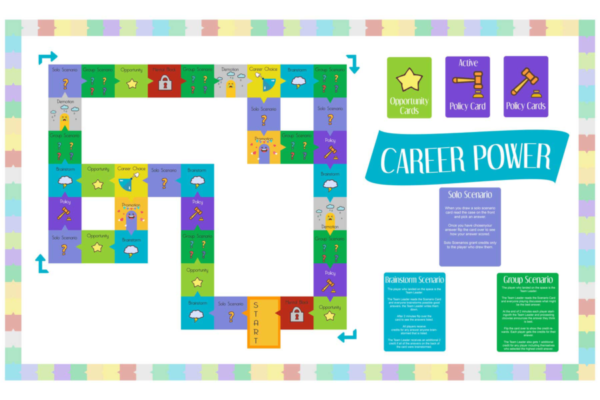 The result is a board game approach to increase the personal power and success of technology professionals in early career. Volunteer Opportunity: The next project is to put Career Power online. We are looking for individuals or a game company willing to partner with for this and to co-develop more WIT-y games. Contact us to discuss ideas. Collaborating Colleagues: Thanks to my student team led by Chris Robeck as product manager along with Rebecca Annis, Xuan Zhang and Vichita Jienjitlert. Thanks to Bill Kules the supervising professor at University of Maryland for all his support. Next Steps: Career Power is ready to preorder. We are producing a few test copies now! Please sign up to be notified. And spread the word! Donate: Career Power is ready for production. To spread the word we’d like to use them at conferences. Help us raise funds to support this. Our goal is $5,000. Donate now.